Need help translating and identifying this (converted vase?). In the context of its accompanying floral decoration, the inscription on your Chinese vase carries the message "Blooming flowers signal prosperity" (Hua kai fu gui - 花開富貴). This is a traditional New Year Greeting in China. 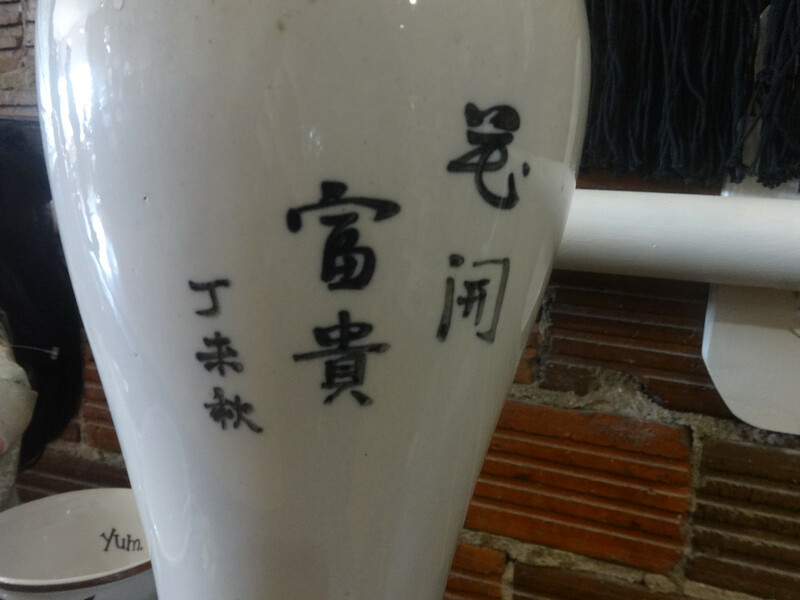 The stack of three characters to the left of the inscription is a cyclical date of the autumn of the Dingwei Year (dingwei qiu - 丁未秋), which probably coincides with 1967 if there are no other markings to the contrary on the vase. It may be that the piece was made in Taiwan, since the Great Proletarian Cultural Revolution was in progress at that time on the Mainland, and your vase seems to lack any redeeming relevance to Marxism, Leninism or Mao Zedong thought.